You may register for the conference here! OACRAO is interested in helping you justify your attendance at our conference. Following are some points you could consider including in your justification, some suggested items to include, and a sample letter. Networking: where else, for a small investment, can I be in contact with people from my profession and vendors who will be able to explain their services? Sessions on important topics: I will be able to bring good information back to the institution about issues that are currently being discussed at a national, regional, and state level. The association promotes the well-being and advancement of professionals in the higher education community by engaging members in the collaborative pursuit of excellence in admissions, registration, and enrollment services. The association provides relevant programs, professional development tools, and information resources necessary to chart the course for professional success. 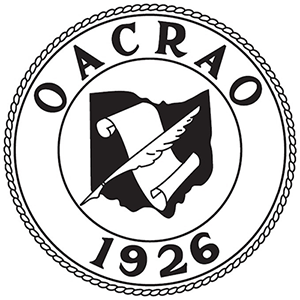 OACRAO’s mission is to provide professional development regarding best practices, standards, and guidelines in records management, admissions, enrollment management, administrative information technology, and student services to higher education officials in Ohio. In addition to the many benefits that AACRAO provides its members, OACRAO members enjoy educational workshops and lively conferences. Add specific reasons that your attendance will be a good return on the institution’s investment. FERPA training will give me a sound basis for interpreting the legislation and what our best practices should be. We need to improve our procedures for graduation; there will be several sessions highlighting this process. AACRAO regularly sends one of the members of the board to the OACRAO Conference; this is an excellent opportunity to hear what is happening at the national level without traveling a long distance. The Conference_Benefits Microsoft Word document contains all of this information, including a sample letter! Check out the fun from last year's 90th anniversary in our 2016 OACRAO Conference at Deer Creek photo album.